Sometimes you just have to let go and have faith that it will all work out. This past weekend, I finally took my Quick Curve Ruler out of the package for a test-drive. 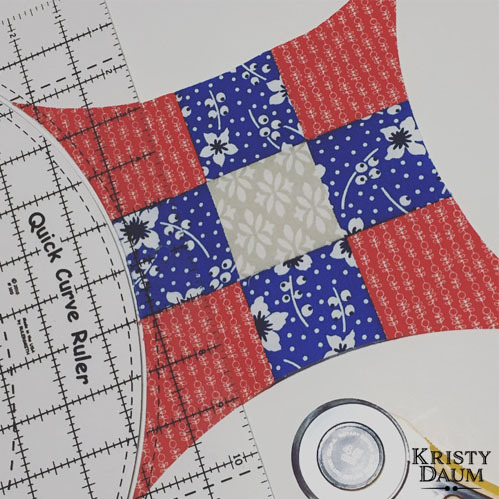 It along with the URBAN TILES pattern from SewKindofWonderful would be my companions as I traveled down this curvy road towards something which I hoped would be a finished block; but I was hesitant. For starters, I have not really worked with curves much before and this block has A LOT of them. You might remember last week when I shared what fabrics I chose for the TopHop2016 Traveling Quilt Project, well today was the day to start cutting into them. I took it one step at a time, triple checking everything just so I didn’t mess up; but after a while I got the hang of it. After an hour or so, I finished the center and immediately shared it on Instagram. My confidence was building for the balance; which would have to be started the next day. I felt refreshed and ready to pick up where I left off. Soon enough, after lots of cutting and piecing the block was finished...or so I thought. I gave it a good pressing and hung it up, so I could view it from a distance. 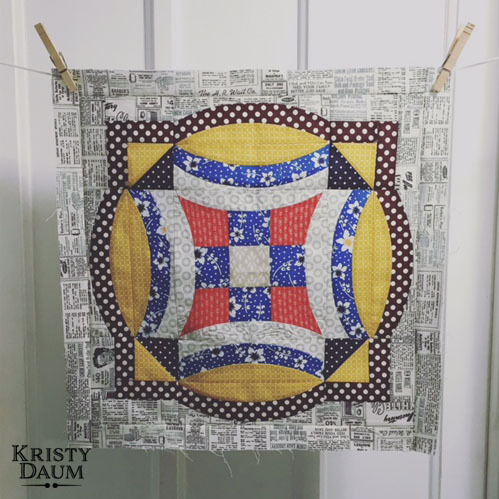 What I noticed right away was how busy the block looked and although I planned it that way, I need to add some "breathing room" along the block's edges; before a fellow TopHop participant would add the first border. In a few weeks, we will all be swapping our first TopHop2016 blocks, not seeing them again for a whole year. Fun!! This turned out so great! Can't wait to send something of my own out into the universe!